In accordance with the wishes of the many people concerned about the numerous claims that my stance on the two Karmapas has been contradictory over the years, I would like to take this opportunity now to openly explain the errors in these allegations and clear any doubt in regards to any position I have taken in the past or hold today on this matter. The first allegation that is commonly made is that I originally accepted Ugyen Thinley Dorje as the Karmapa but later reneged on this commitment and recognized Trinley Thaye Dorje instead. Secondly, it has been said that I assured a delegation sent by His Holiness Dalai Lama that I would not make a claim on the throne of the Karmapa, yet a court case was filed for the control of Rumtek monastery in Sikkim. I will now explain clearly and concisely why these accusations are false and riddled with errors in both facts and in interpretation of any statements made by myself on this matter to this day. In May of 1984, the Karmapa Charitable Trust (hereon referred to as the KCT) conducted a meeting. This was the second meeting held by the KCT since the passing of His Holiness the 16th Karmapa. In this meeting, it was decided to dissolve the so called Four Regents group. This decision was agreed upon by the trustees on the basis that there was no explicit instruction given by His Holiness the late 16th Karmapa to form such an assemblage and, in the records of the Karma Kagyu lineage, there has not been any historical precedent for this whatsoever. 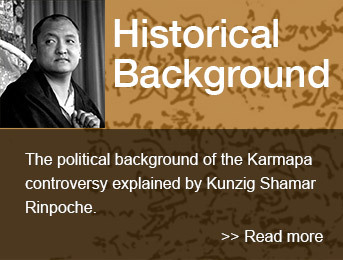 In fact, Situ, Gyaltsub and Jamgon Rinpoche have their own labrang (administration) separate of the Karmapa’s. However, it was agreed at the time that the four Rinpoches would still collaborate in jointly taking the responsibility of finding the reincarnation of the late 16th Gyalwa Karmapa. In accordance with this decision we held four subsequent meetings on this matter, the last meeting being held at the New Delhi Oberoi Hotel in February of 1990. In this last meeting, a statement was written in Tibetan by Jamgon Rinpoche and signed by the four of us to be circulated among the monasteries of the Karma Kagyu. In this resolution, we decided that we would wait for an authentic letter from His Holiness the late 16th Karmapa to be found and at that time we would accordingly investigate the matter further. This decision was based on a prior decision made in 1986 regarding the so-called discovery of inner and outer instructions supposedly left by His Holiness the late 16th Karmapa for which particular pujas were to be performed and timely steps were instructed to be taken. This was also Jamgon Rinpoche’s suggestion and agreed to by the three of us. In essence, this meeting’s resolution was just a renewal of the previous resolution made in 1986. However, directly after this unanimous decision was given and circulated, Situ Rinpoche collaborated with the Chinese Government, according to the interests of the Government of China, and appointed a boy in Tibet as the Karmapa. At that time, this was not publicly revealed, though it quickly became known. This act was in direct contradiction to the agreement made in New Delhi. Then, in March of 1992, Situ Rinpoche revealed his prediction letter in a meeting, which I rejected on the basis of its questionable authenticity due to its obvious similarity to Situ’s own handwriting and other noticeable defects. After much discussion, it was agreed that the letter should be locked away and kept safely at Rumtek until it could be checked more thoroughly. However, starting in May of that year, while I was participating in the opening ceremony of the Shi Lai Monastery in Los Angeles California, Situ and Gyaltsub Rinpoche announced to the Rumtek community that they had found the 17th Karmapa, presenting the prediction letter to the public as well as to His Holiness Dalai Lama, gaining the support of Dharamsala. By the time I had a chance to hear of any of this in the United States and take action to stop it, the boy had already been enthroned in Tsurphu, with the acceptance of the Dalai Lama, and the media had already spread the news. Nevertheless, I immediately left for India to Rumtek to do what I could at this point to address the situation. My comments on the circumstances at that time have since been completely distorted and used out of context of the situation to seem as though my position as it stands now and the position I took then are in contradiction. This is simply not the case at all. On the 7th of June 1992 I arrived in Rumtek and announced that this was not according to our agreement and that the recognition of Ugyen Thinley was in contradiction with our mutual agreement and that the prediction letter must undergo forensic testing. Tulku Ugyen then came urgently from Nepal. From the 15th through the 17th of June, Tulku Ugyen came to me prostrating and desperately requested me to withdraw the request to have the prediction letter forensically tested and to accept Ugyen Thinley as a Karmapa, which I finally did out of respect and compassion. This act of supplication from Tulku Ugyen was witnessed by Lopon Tsechu Rinpoche and Beru Khyentse Rinpoche. I also understood that Situ was not the only one involved in making the fake letter. It was forged by his hand for certain but he was clearly not the only one behind this. Regarding the recent actions already taken in Tibet by recognizing a boy in accordance with the Chinese Government’s interests, I had given a written letter with my consent, since His Holiness Dalai Lama already agreed. It was also understood that the Chinese Karmapa would remain in China/Tibet. I agreed to this out of respect for the Dalai Lama. I said nothing more than that on the matter, as not to cause any trouble during such turbulent times. I had every intention of finding the genuine reincarnation of the Karmapa and enthroning him at Rumtek, as this was extremely important in order for the genuine Karma Kagyu lineage to continue. However, these sentiments were not expressed openly to the public at that time, as it would have added fuel to the fire that was already blazing. Soon after, Situ Rinpoche made his own translation of these conversations into English and circulated his false version of my statements to the American media and his followers. An accurate translation was published in the Karmapa Papers, a book authored by a team of experts organized by Michel Nesterenko. As the Government of China had now been involved and there was good reason for intrigue from the side of the Government of India, I officially informed a delegation sent from the Indian Government that I had the intention of traditionally recognizing the genuine reincarnation of Karmapa and would have him enthroned in Rumtek. Likewise, I also carried a written statement to the same effect on the 29th of June 1992 and delivered it personally to His Holiness Dalai Lama in Dharamsala, expressing my intention to recognize the Karmapa traditionally. In 1994, I managed to officially recognize His Holiness Karmapa Thaye Dorje, who was 10 years old at the time, and invited him from Tibet to India without any difficulties, along with his parents. We conducted the welcoming ceremony in March of that year at the Karmapa International Buddhist Institute in New Delhi. In April of 1994, His Holiness Dalai Lama sent a group of delegates from the Gelug, Nyingma, Sakya, Kagyu and Bon schools along with his secretary of cultural affairs to New Delhi to request that this controversy finally be decided. At that time, Ugyen Thinley was still placed in Tsurphu with the support of the Chinese Government. I told the delegation that I have no problem with there being a Karmapa in China, as this has already happened and I have no quarrel with the Government of China to fight for the seat at Tsurphu Monastery. Likewise, I had no interest in making trouble with Dharamsala. As far as I was concerned, Situ and Gyaltsub had already gone to China and gained the support of the Government there. I had no objection for what had already passed in China and remained without any objection. By then, Rumtek had already been forcefully taken over by Situ and Gyaltsub Rinpoche in collusion with the then Chief Minister of Sikkim N.B. Bhandari and his corrupt Government. Therefore, I was not so arrogant as to boldly reveal to this delegation that we were waiting for the fall of N.B. Bhandari’s dictatorship before filing our case to regain possession of Rumtek Monastery. Even a child could have understood that I was indicating to this delegation that China is China and India is India. In 1995, Chief Minister N.B. Bhandari’s Government finally fell. After that we made our best efforts to come up with a peaceful solution together with the new Government of Sikkim, in order to avoid having to take up these matters in court. Even the official monks of Rumtek, who had been exiled in the takeover of August 1993, conducted a hunger strike at that time. However, the new Chief Minister explained to us that, due to the fact that the monastery had already been taken over years before and remained in the possession of those who had overthrown the genuine administration of Rumtek and the original monastic body, the matter must be taken up in the court as the necessary legal course of action. He assured us that, since he had already toppled the dictatorship of Bhandari, balance has now been restored in the Government of Sikkim and the court will now be able to take our case. We cooperated with this suggestion and immediately ended the hunger strike. We then decided to have His Holiness Karmapa Trinley Thaye Dorje enthroned in Bodhgaya in December of 1996. After the enthronement in Bodhgaya, I went to meet His Holiness Dalai Lama once again. I informed him that I had now followed through with traditionally recognizing and enthroning the Karmapa in India, just as I had said I would do in my written letter handed over to His Holiness in June of 1992. At this time I requested His Holiness Dalai Lama to give Karmapa Trinley Thaye Dorje the semi- monk’s vows, which he completely agreed to do with delight. He said it would be very good to do so and that he would be happy to meet my Karmapa. He commented that as there are now two incarnations recognized as the head of the Taklung Kagyu School and there is no conflict between them and both are doing very well, there should be no problem between the two Karmapas either. He then asked when I would like to bring the Karmapa to see him. I said I would bring him directly after the coming Tibetan New Year. His Holiness immediately understood that I had chosen an auspicious time for them to meet. He expressed his happiness over this decision, agreeing that we should not do anything at the end of the year or at the end of the month and indicated his appreciation for the auspicious choice of doing so in the beginning of the New Year. Any sensible person can clearly see, I have been quite transparent over the years in my dealings with His Holiness Dalai Lama and have completely kept my word along the way. Therefore, to date there have been no contradictions in my stance on these issues. It is merely the misinterpretation of the public, disregarding the surrounding circumstances of the time and perhaps the lack of complete information about my undertakings in the wake of these initial betrayals. Unfortunately, after I returned from Dharamsala, I received a letter from His Holiness Dalai Lama’s Private Office signed by his secretary stating that what had been promised during my discussion with His Holiness will no longer happen. The central reason given for the sudden change of heart from the Office of His Holiness Dalai Lama was that if His Holiness met my Karmapa, the reaction from Situ Rinpoche and his monks would likely cause a blood bath in Dharamsala. A blood bath? Is this the reaction one would expect from Buddhists? In any case, the promises made by His Holiness Dalai Lama had thus been completely revoked. To date, I have never changed my position or broken any promises. If I am guilty of changing any position at all, then it is that I finally accepted Ugyen Thinley as a Karmapa in China after first disagreeing and I chose not to pursue the forensic tests on the prediction letter presented by Situ Rinpoche any further, as mediated by Tulku Ugyen. If this change of position is dissatisfactory to Situ Rinpoche’s supporters, then it is very easy for me to continue onward with my original proposal. On all other concerns surrounding this issue of the two Karmapas, I have not budged and have stood firmly in my position. Hence, any accusations towards me claiming otherwise are baseless and misguided. I remain resolute.